John Braithwaite, the younger (1797–1870), was an English engineer who invented the first steam fire engine. Attended in his father's manufactory, where he made himself master of practical engineering, and became a skilled draughtsman. 1817 he reported before the House of Commons upon the Norwich steamboat explosion, and in 1820 he ventilated the House of Lords by means of air-pumps. In June 1818 his father died, leaving the business that later became Braithwaite and Ericsson to his sons Francis and John. Francis died in 1823, and John Braithwaite carried on the business alone. He added to the business the making of high-pressure steam-engines. 1823 He cast the statue of the Duke of Kent by Sebastian Gahagan which was erected in Portland Place, London. 1827 He was introduced to George and Robert Stephenson; about the same time he became acquainted with John Ericsson, who then had many schemes in view. At this time Braithwaite manufactured the first practical steam fire-engine, which was ultimately destroyed by a London mob. It had, however, previously done good service at the burning of the English Opera House in 1830, at the destruction of the Argyle Rooms 1830, and at the conflagration of the Houses of Parliament in 1834. It threw two tons of water per minute, burnt coke, and got up steam in about twenty minutes; but it was looked upon with so much jealousy by the fire brigade of the day that the inventor had to give it up. He constructed four others of larger dimensions, two of which, in Berlin and Liverpool respectively, gave great satisfaction. In 1833 he built the caloric engine in conjunction with John Ericsson. Next year he ceased to take an active part in the management of the engine works in the New Road, but began to practise as a civil engineer for public works, and was largely consulted at home and abroad, particularly as to the capabilities of and probable improvements in locomotive engines. In 1834 the Eastern Counties Railway was projected and laid out by him in conjunction with Charles Vignoles. The act of incorporation was passed in 1836, and he was soon after appointed engineer-in-chief for its construction. He adopted a five-feet gauge, and upon that gauge the line was constructed as far as Colchester, the works, however, being made wide enough for a seven-feet gauge. On the recommendation of Robert Stephenson it was subsequently altered to the national gauge of 4 feet 8½ inches. In after years Braithwaite advocated a still narrower gauge. He ceased to be officially connected with the Eastern Counties Railway on 28 May 1843. Whilst engineer to that company he introduced on the works the American excavating machine and the American steam locomotive pile-driving machine. He was joint founder of the Railway Times, which he started in conjunction with Mr. J. C. Robertson as editor in 1837, and he continued sole proprietor till 1845. He undertook the preparation of plans for the direct Exeter railway, but the panic of the period, and his connection with some commercial speculations, necessitated the winding up of his affairs in 1845. Braithwaite had, in 1844, a share in a patent for extracting oil from bituminous shale, and works were erected near Weymouth which, but for his difficulties, might have been successful. Some years before, 1836–8, John Ericsson and he had fitted up an ordinary canal boat with a screw propeller, which started from London along the canals to Manchester on 28 June 1838, returning by the way of Oxford and the Thames to London, being the first and last steamboat that has navigated the whole distance on those waters. The experiment was abandoned on account of the deficiency of water in the canals and the completion of the railway system, which diverted the paying traffic. In 1844, and again in 1846, he was much on the continent surveying lines of railway in France, and on his return he was employed to survey Langston harbour in 1850, and to build the Brentford brewery in 1851. From that year he was principally engaged in chamber practice, and acted as consulting engineer, advising on most of the important mechanical questions of the day for patents and other purposes. 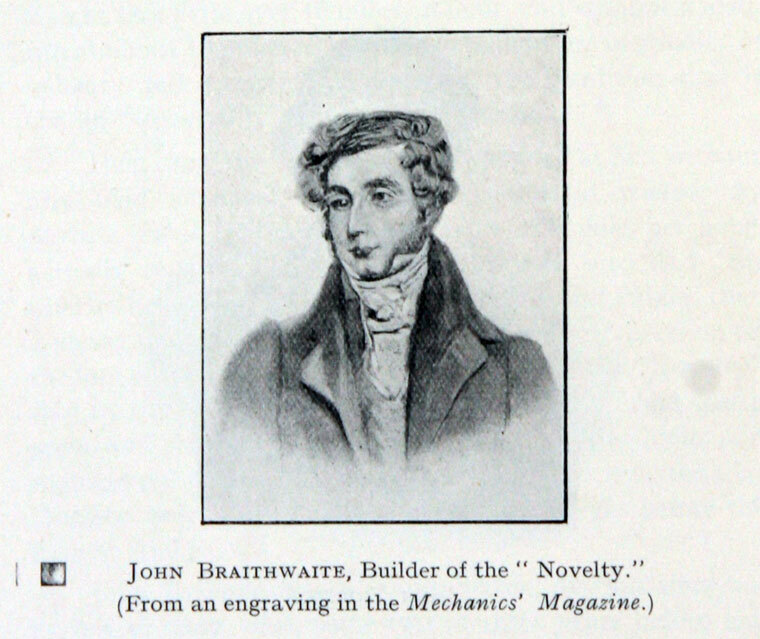 Braithwaite was elected a fellow of the Society of Antiquaries in 1819, a member of the Institution of Civil Engineers on 13th February 1838, and at the time of his death he was one of the oldest members of the Society of Arts, having been elected into that body in the year 1819; he was also a life governor of seventeen charitable institutions. 1838 John Braithwaite of London, Civil Engineer, became a member of the Institution of Civil Engineers. He died very suddenly at 8 Clifton Gardens, Paddington, on 25 September 1870 aged 73, and his remains were interred in Kensal Green Cemetery. John Braithwaite was the third son of the late John Braithwaite, whose ancestors had carried on a small engineer's shop and smithy at St. Albans from the year 1695, and was born at No. 1, Bath Place, in the New Road., London, on the 19th of March, 1797. In the year 1806-7 his father was operating with the diving bell on the 'Earl of Abergavenny,' East Indiaman, sunk off Weymouth, from which he recovered £130,000 of specie, as well as the general cargo, and successfully blew up the wreck with gunpowder. In this undertaking he was assisted by the subject of this memoir, who, young as he was, was entrusted with the signalling from his father, who was at work below, and who was frequently under water for from six to eight hours at a time. Mr. Braithwaite was educated at Mr. Lord's school at Tooting in Surrey. From the time he left school he was at home attending in the manufactory, and making himself master of the different trades pertaining to mechanical engineering; and he became a skilled draughtsman. In February, 1818, his father died, leaving the business to his sons, Francis and John. Francis died in 1823, and John Braithwaite carried on the business alone, having inherited a large connection with the London brewers, distillers, water-works companies, and being engaged in the manufacture of pumps, sinking wells, &c.
He increased this business considerably in Scotland, Ireland, and the West Indies, and added to it the making of high-pressure steam-engines, many of which, from 1 H.P. to 30 H.P., are still working satisfactorily. Besides these works he had, in 1817, been called in by the then existing Committee of Engineers, held in the Strand, to report upon the Norwich steam-boat explosion before the House of Commons; and in 1820 he ventilated the House of Lords by means of air-pumps. In 1822 he made the donkey engine, and in 1823 cast the statue of the late Duke of Kent. He was a great patron of inventors, rendering them much real service to enable them to develop their ideas and plans, and in a manner that secured him the esteem of all who availed themselves of his valuable practical experience. In 1827 he was introduced to Messrs. G. and R. Stephenson; and about the same time he became acquainted with Captain John Ericsson, who then had many schemes in view. This engine was the first that ever ran a mile within a minute, as it did that distance in fifty-six seconds. At this time Mr. Braithwaite constructed the first practical steam fire-engine, which was ultimately destroyed by the London mob. It had, however, previously done good service, among other places, at the burning of the English Opera House, at the destruction of the Houses of Parliament, and had assisted largely in extinguishing the fire at Messrs. Bishop’s distillery, for which service Mr. Bishop gave him £500. It threw 2 tons of water per minute, burnt coke, and got up steam in from twenty minutes to thirty minutes: but it was looked upon with so much jealousy by the fire brigade of the day, and such impediments were thrown in the way of its working such as playing cold water upon the boiler, &. - that he gave it up. He, however, constructed four others of larger dimensions; one for the municipality of Berlin, and one for Liverpool, which gave great satisfaction. In 1833 Mr. Braithwaite built the caloric engine in conjunction with Captain Ericsson. Next year he ceased to take an active part in the management of the engine works in the New Road; but began to practise as a civil engineer for public works, and was largely consulted at home and abroad upon various railway and other undertakings and mechanical appliances, particularly as to the capabilities of, and probable improvements in, locomotive engines. Mr. Braithwaite was a strong advocate of four-wheel light inside-cylinder engines, and a supporter of the views of the late E. Bury, M. Inst. C.E., as to light engines and frequent trains, with duplicate power for heavy loads; but he afterwards altered several engines by adding another pair of wheels. In 1834 the Eastern Counties railway was projected and laid out by him in conjunction with Mr. Vignoles. The Act was passed in the year 1836, which incorporated the Eastern Counties Railway Company for constructing a line of railway from Shoreditch, London, to Norwich and Yarmouth, via Colchester and Ipswich, with a stock and loan capital of £2,133,000, and he was soon afterwards appointed Engineer-in-chief for its construction. At that time there was no gauge Act in operation, and engineers were free to select the gauges of their respective lines. Mr. Braithwaite apparently considering the Eastern Counties isolated as to railway communication from the manufacturing districts, and likely to remain so, and well knowing by experience the ill effects of the then considered and admitted insufficient boiler and machinery space, for efficient and economic working, within the ordinary gauge of 4 feet 8.5 inches, advised the adoption of a 5.5 feet gauge, which was afterwards reduced to 5 feet, and upon that gauge the line was constructed as far as Colchester, a distance of 51.25 miles, to which place it was opened in March, 1843, the works being made wide enough for a 7 feet gauge. On the recommendation of Mr. Robert Stephenson, it was subsequently altered to the national gauge of 4 feet 8.5 inches ; and the change was effected on the Northern and Eastern, Eastern Counties, and Blackwall railways between the 5th of September and the 7th of October, 1844. In after years, Mr. Braithwaite advocated a still narrower gauge than that of 4 feet 8.5 inches. He ceased to be officially connected with the Eastern Counties railway on the 28th of May, 1843. While Engineer to that company he introduced on the works the American excavating machine, the power of which was fairly tested. In a stiff clay the original and imperfect machine from New York filled the earth-wagons at a cost of l.5 pence per cubic yard, all expenses included! ; and in America it is still used, particularly for dredging. In like manner Mr. Braithwaite endeavoured to utilise the American steam locomotive pile-driving machine, which failed, not by its demerits, as subsequent application has proved, but from disagreement among the patentees, of whom Mr. Braithwaite was one. He was joint founder of the Railway Times, which he started in conjunction with J. C. Robertson, as editor, in 1837, and he continued sole proprietor till 1845. In that year he had been drawn into some commercial speculation, which, together with his undertaking the preparation of plans for the direct Exeter railway, and the panic of the period, necessitated the winding up of his affairs. Mr. Braithwaite had, in 1844, a share in a patent for extracting oil from bituminous shale, and works were erected near Weymouth, which, but for his difficulties, might have been successful. Up to this time Mr. Braithwaite had assisted Captain Ericsson in many costly experiments at the manufactory. Some years before, 1836-38, they had fitted up for John Robins an ordinary canal boat with a screw propeller designed by Captain Ericsson, which started from London along the canals to Manchester on tho 28th of June, 1838, returning by way of Oxford and the Thames to London, being the first and last steam-boat that has navigated the whole distance on these waters. The boat maintained a speed of from 5 miles to 6 miles an hour on the canals, and upwards of 9 miles an hour on the river, when fully loaded. This was considered at the time a great success, but was abandoned on account of the deficiency of water in the canals, and the completion of the railway system, which diverted the paying traffic. In 1844, and again in 1846, Mr. Braithwaite was much on the Continent surveying lines of railway from Paris to Dieppe, the Eastern of France, and others; but he still found time for other business, such as surveying Langston harbour in 1850, and building the Brentford brewery in 1851. From that year, however, he was principally engaged in chamber practice, and acted as consulting engineer; advising upon most of the important mechanical questions of the day, for patent and other purposes, in which his opinion was much sought after and highly esteemed. Mr. Braithwaite was always kind and hospitable; his apprentices and employees were noticed by him and liberally treated. His conversation was lively, frequently instructive, and a vein of humour appeared in his remarks. He had no mean skill in painting and drawing, and his professional sketches were clear and explanatory. He was correct in his calculations, strict in his estimates, and his works on the Eastern Counties railway were characterised by solidity of construction. Mr. Braithwaite was elected a Member of the Institution on the 13th of February, 1838, and at the time of his death he was one of the oldest members of the Society of Arts, having been elected into that body in the year 1819: he was also a life governor of seventeen charitable institutions. He died very suddenly on the 25th of September, 1870, and his remains were interred at Kensal Green Cemetery. This page was last edited on 13 March 2019, at 18:25.